One of the largest and very common spider is the golden-silk spider. This member of the orb-weavers family is also often called banana spider. My photograph of a golden-silk spider hanging below her web won honorable mention in the Advanced category of Orange Audubon Society's 2015 Chertok Nature Photography contest. The male golden-silk spiders are much smaller than the females, as can be seen in several of the photographs on the Nephila clavipes page at Wild Florida Photo. The spiny orb-weaver is a much smaller but very distinctive spider. Also known as the crab spider or spinybacked orbweaver spider, this is also a fairly common spider, especially in Florida citrus groves. The range of Gasteracantha cancriformis extends across the southern United States, through Central and much of South America. This species may have different markings in other parts of it's range than that shown here, which is how they look in Florida. Unlike most of the other orbweavers, the Orchard Orbweaver spins its web on a horizontal or only slightly tilted plane. This small spider, also called the Venusta orchard spider, hangs below the center of the web which can often be seen off to the side of trails. Last month's blog post included a crab spider on rayless sunflower. This is one of the Mecaphesa species in the crab spider family. These are also called flower spiders because instead of building webs to catch prey, they lie in wait, often well camouflaged, and catch insects that come to visit the flower. The flower spider on horsemint below is another example. This spider had caught a small bee soon after this photo was made. The image at the top of this post is a black and yellow Argiope. Also called the writing spider for the distinctive zig-zag pattern on the web. 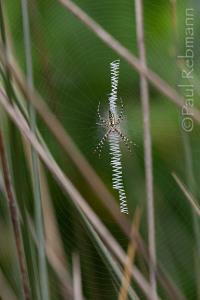 These patterns are called stabilimentum and the immature spiders of this species make a circular one as shown below. The purpose of the stabilimentum is debated by experts. Although the name might indicate that it stabilizes the web this is not currently considered the primary function. A number of theories include: camouflage for the spider, attracting prey, attracting a mate, molting platform, sun protection, and silk production practice. Most spiders are relatively harmless to humans, at most inflicting a painful bite. In Florida only widow and recluse spiders are venomous. You can read more about them at the Florida Department of Agriculture and Consumer Services website. Spiders are part of nature's insect control, so not only are they pretty to look at, they can be beneficial to have around. These are only a few of the many kinds of spiders, some more that occur in Florida can be seen at Wild Florida Photo.